The Women's March and companion animals: Why human rights matter. Note: This post was written in response to those who asked why reps from dog advocacy group BADRAP chose to participate in the Jan 21 Women's March. Last Saturday, we canceled classes and lifted foster dog Lolo into our car along with some quickly made signs and headed downtown to Oakland's Women's March. We didn't know what to expect to be honest, but - serendipity - the first people we ran into were former adopters with their three young kids. Kids and families with handmade signs were everywhere, in fact. We were definitely at the right place. We soon had to give up on keeping track of our friends - The crowd was just too massive. (One in 45 California residents marched. 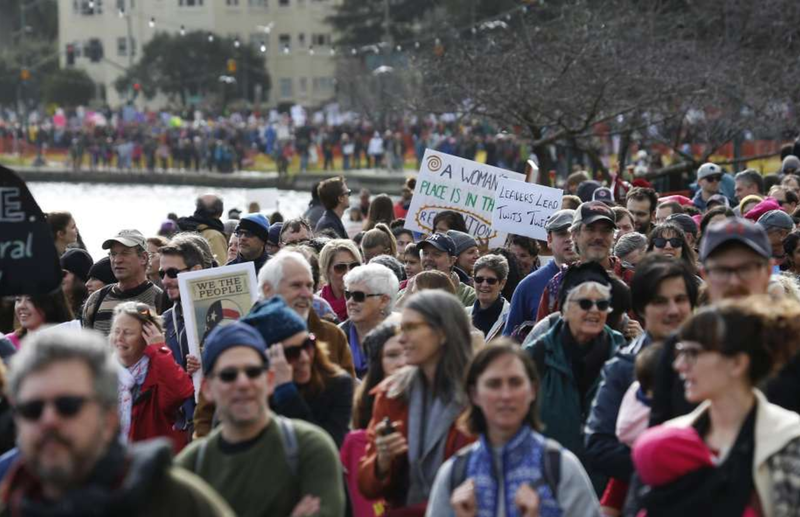 An estimated 100K counted in Oakland and upwards of 4.6+ million just in the US). While waiting for some kind of announcement to signal the start, we were squeezed into a shoulder to shoulder, slow motion lava flow down Madison Street with the impressively resilient Lolo. Drums were beating, people bopping up and down, pink hats, strollers, kids on parents shoulders, a cornucopia of signs. Everyone smiling and there was chanting and high five-ing and hugging. Wait. We're crammed like sardines, we don't know what the plan is or where the next bathroom will be. Why are we all so HAPPY? Then the realization that the march had started, and without knowing it, we were already in way deep. Technically, we've been in way deep since our group was birthed in 1999, even more so since our KeepEm Home mission found its legs. Our nation's pets - pit bulls in particular - will just keep falling into crisis until we tackle the perennial obstacles that block their humans from the support and resources more fortunate dog owners take for granted. Let's be real; we can't begin to save all the sheltered dogs that need to be saved, especially while outside pressures push animal shelters into a constant state of overcrowding and crisis. Something's gotta give. The Woman's March was an affirmation of what is sacred and what needs support and tending to in our country. What do we want? Safe, humane communities for all. How do we get it? By acknowledging our neighbors' struggles. By taking a stand when fundamental human rights are threatened. So why did we march? We marched for worker's rights, including the compelling need for a living minimum wage - because when families are forced to piece several jobs together just to cover their basic necessities, everyone suffers including their children and pets. (Don't tell me that struggling families don't deserve pets - don't even go there). Throughout history, nice families have sold puppies to help keep food on the table and that practice continues today. Affordable vet care and training classes are in short supply. Affordable housing shortages plague our cities; now more than ever, large numbers are relinquishing their pets when they can't find rentals that will accept them. Our animal shelters are a living museum of these disparities, and they struggle daily with the overflow. Suicide. The trends that contribute to pet homelessness are inhumane to everyone, including animal shelter and rescue workers who deal with such high intake numbers and so much burn out that they face the highest suicide rate among US workers: 5.3 in 1 million workers - a rate shared only by firefighters and police officers. Link: The fatal epidemic no one is talking about. We marched for affordable health care for all. And paid sick days, because when the key provider of a struggling family falls ill and bills can't be paid, gut wrenching decisions to surrender pets naturally follow (See Mila's story). We marched for the rights of indigenous peoples, including the peaceful, prayerful water protectors of Standing Rock who've been working tirelessly to block the Dakota Access Pipeline from destroying their sacred lands and poisoning a river. Their courage and vision inspires us and is echoed in struggles of indigenous peoples around the world. We marched for People of Color, and the need to address racism in all its forms. Because when you own a pit bull and your skin is brown or black, just imagine the ways that the world (strangers, potential landlords, law enforcement) can judge. We marched for refugee and immigrant rights, because they're our neighbors, friends, co-workers. And we marched for Muslims, because our dogs have taught us that stereotypes lie and fear cripples us all. We marched for LGBTQ rights as we do every year in SF's Pride Parade, not just because many of our volunteers and adopters are gay, but because the LGBTQ community was the first to extend a welcoming hand to us 18 years ago, back when BADRAP was a young org and pit bulls were widely rejected and stereotyped. They get it. Finally, we marched for ourselves. Because it felt so completely right to be surrounded by thousands of positive, supportive, decent human beings who believe in participating in a hopeful future. The wake up call was just what we needed. Animal welfare world, this is long overdue: It's time we connect the dots and acknowledge the undeniable connection between human rights issues and companion animal issues. Fundamental human rights must be ardently defended if we truly care about companion animals.